Travelers on I-64 near the I-81 intersection at Lexington, Virginia might find themselves distracted by a large, shiny complex of blue-roofed barns and arenas that is the Virginia Horse Center. The highly visible, expansive campus, which seems to go on forever, is just one of the various types of horse parks across the country. On the other side of the continent, Washington State Horse Park isn’t as immediately obvious to passersby as they traverse Interstate 90 at Cle Elum. The 112 acre park is heavily vegetated; other than the area cleared for the arenas and stalls, much of the park’s trails and cross country course is nestled within relatively undisturbed woodland. While basic horse park facilities – barns, arenas, outbuildings, courses and trails – may appear to be similar from park to park, the layout, style, function and relationship to the surrounding communities can be quite different. Different too are the funding and operating mechanisms that allow them to come into being and to persist. The Virginia Horse Center was founded in 1985 by the state legislature as a way to stimulate Virginia’s equine economy following an economic impact study. Here is a rundown of the economic impact of the Center: 115 events are hosted annually, drawing 500,000 people and 100,000 horses. An estimated $88 million in jobs and sales is generated for its home county of Rockbridge and the state. Those events include eventing, dressage, hunter/jumper, breed, and 4-H shows, as well as fundraisers for the Center’s in-house therapeutic riding program, Hoofbeats Therapeutic Riding Center. For 21 years, the facility operated as a public-private partnership with the state as a 501(c)(3) non-profit. In dual roles, a publicly-appointed board ran operations while a private board worked on opportunities for growth and funding. The state government ultimately dissolved the partnership as a cost-cutting measure, awarding the land through a USDA loan and leaving the Center, which now includes 19 show rings, a 4,000 seat coliseum, eight barns, a cross country course, and campground over 600 acres, to fund itself. The transition wasn’t well-publicized, creating a public relations struggle for executive director Katherine Truitt. Few within the Lexington community understand how much the Center helps the area’s economy. The Virginia Horse Center Foundation, the facility’s fundraising arm, contends that every dollar donated results in $20 in economic impact to the community. Truitt attributes the confusion to a history of strained relations between Center directors and Rockbridge residents. The existence of Center raised property values in the area, in some cases to a prohibitive level. The community’s vitriol increased when a new lodging tax passed. “A lot of people don’t know that it’s a lodging tax; they think that it’s a restaurant tax, or their tax money. That lodging tax is paid, for the most part, by our exhibitors,” said Truitt, who said most exhibitors are traveling in from outside the community. Improving community relations is one of Truitt’s long-term goals, and she is full of ideas as to how to entice even non-horsey Rockbridge residents to the Virginia Horse Center. Most of the shows and events are free to attend. Truitt encourages local military groups to use the property for camping and rents the facility for expos, charity projects, and job fairs. So far, she thinks these efforts are helping, but that there is more work to be done. “I really feel like I need to partner with the County and the cities to keep the relationship strong. I believe it will only benefit both sides,” said Truitt. The overriding goal is to improve the Center’s future financial stability. This includes a broadening of the Center’s focus to include agricultural industries beyond horses, in order draw in a greater cross section of the community and provide more opportunities to host events. Truitt is also working on obtaining a conservation easement for the property to ensure long term existence. She reports that there are no further plans for expansion of the Center as the campus already includes the major elements needed. To reduce the Center’s environmental impact, there are plans to install a well and improve lighting efficiency at the facility. Currently, the Center practices rainwater collection by using rain barrels for building rooftop runoff. Future dollars will be focused on maintenance and upgrade of existing facilities. For example, Truitt plans to replace the footing in one arena with synthetic, springier material when she is able to secure funding. Washington State Horse Park is still in its early stages of growth, facing new projects and challenges. More recently established than the Virginia Horse Center, the Park opened in 2010 with a $3.5 million award from the state, but had strong private financial support from the start. The Beardsley Family Foundation was a major supporter, providing $60,000 to help purchase equipment and do some construction, and to finish several other projects on the facility, which is part of a conservation easement. The Park features more than ten miles of trails, a cross country course and gallop trail, three arenas, and a plethora of pens, stalls, and outbuildings. None of the facilities are covered, so the park closes during the winter months to keep operating costs low. The facility seeks to host every equine discipline except rodeo, racing, or polo, and its repertoire already includes everything from hunter/jumper to mounted shooting events. 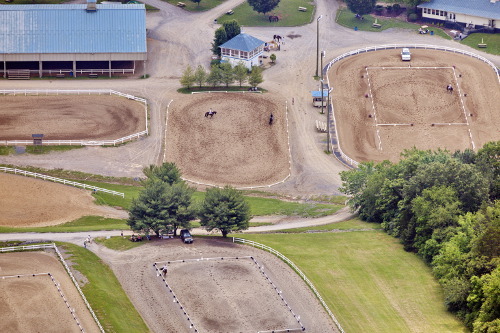 Like the Virginia Horse Center, the Washington State Horse Park was created when the state legislature concluded that there was no adequate existing facility to showcase Olympic-level competition or promote horses as a whole. The legislature approved $3.5 million seed money from the state to help secure the land and get the initial facilities up and running. Both VHC and WSHP rely on grant money derived from their state’s lodging tax. The Park has 30 events scheduled for 2013, with a projected 5,500 visitors, including spectators and competitors—95 percent of whom reside outside Kittitas County. This translates into roughly 10,200 visitor lodging nights, generating $1,632,000. “It is in the middle of the state, which makes it convenient for lots of people but it isn’t in a major metro area. It’s in a fairly economically depressed area, and one of the reasons it’s there is to help drive tourism,” said Thurston. Thurston said that at the outset of the Park project, organizers commissioned a study by Central Washington University’s Economics Department on the structure of existing horse parks, and concluded that it was difficult, if not impossible, for such facilities to be self-sustaining. In general, Thurston thinks the community is supportive of the park and understands why it exists. But letting people know about the need for their support is a challenge. Thurston finds that it’s unusual for casual visitors to come in to watch events, although they are permitted to do so. “I think [local residents] think it’s a good add to the community, that it will draw benefits to the community,” she said. “I think it’s an interesting model. It’s a good model, but it’s a learning curve for people because most of the facilities around here that they’re used to are county fairgrounds or some other government entity-related facility, or they’re a private facility. But this is owned and sustained by the local horse community,” said Thurston. Sustainability, both economic and environmental, is a big part of Thurston’s mission moving forward, as is the case in Virginia. At this point in the Park’s development process, she feels its environmental imprint is low since there are few permanent structures outside of the arenas. Environmental protection has, however, been a constant focus. The trail system and cross country course were designed to preserve the woodlands around the cleared areas, and trails are marked to prevent horses from trampling vegetation. Solar energy is on the agenda to be included in facility roofing projects. A new cross country course on an adjacent parcel of conservation land is also on the horizon for 2013, which could add to the Park’s appeal for endurance competitions. Future planned development will expand the property to include more stabling, another arena, and a campground. Putting a roof on at least one arena will allow the Park to continue events during Washington’s frequently wet weather. “We’re just taking baby steps,” Thurston. All horse parks strive to achieve financial sustainability and serve both equestrian and local community needs, adjusting organizational structure and goals along the way. As it develops, the Washington State Horse Park will continue to take cues from existing parks across the country, while the Virginia Horse Center hopes to forge new territory in appealing to non-equestrians and widening its economic reach. Additionally, they bring in tourism and stimulate local economies, as both the Virginia Horse Center and Washington State Horse Park have demonstrated, no matter the type of competitors they bring to the area. Horse Parks must work with their communities and states to recognize that value and benefit from it. Here’s another perspective – as more and more land is lost to urban development, horse parks will play a vital role in the lives of both equestrians and the community at large. These parks give the community exposure to horses that might not be otherwise available. While drawing non-equestrian locals to their gates has remained a challenge for both Truitt and Thurston, they are up to the challenge. As they well know, if a park helps a new visitor fall in love with horses, it has generated a whole new type of value.